In late 2013, the National Geographic Society called on Avalon to create an individual giving membership program to broaden and enhance its fundraising efforts. In response, we created the “Contributing Membership” program and launched a successful multi-channel Contributing Member acquisition campaign to begin acquiring philanthropic members. OBJECTIVE: After the initial acquisition campaign, Avalon was tasked with finding strategies to further bond National Geographic’s inaugural Contributing Members to the organization, to keep them engaged and giving. STRATEGY AND AUDIENCE: First and foremost, we needed to create a special appeal that would resonate with a file containing only new joins, to keep them interested and active. Capitalizing on the start of a new year, Avalon chose an Annual Fund strategy as a first attempt at additional giving engagement. The letter focused the case for giving on exploration, highlighting some of National Geographic’s most notable discoveries and expeditions as it seeks to further understand the world we all share. We described specific exploration projects—like Paul Salopek’s seven-year trek from Africa to Tierra del Fuego, featured in a recent National Geographicmagazine—as examples of the Society’s invaluable work. Unlike more typical appeal universes that span 24 months, our selects consisted solely of 0-6 month new joins from the October 2013 acquisition campaign—so our message had to be clear and concise. 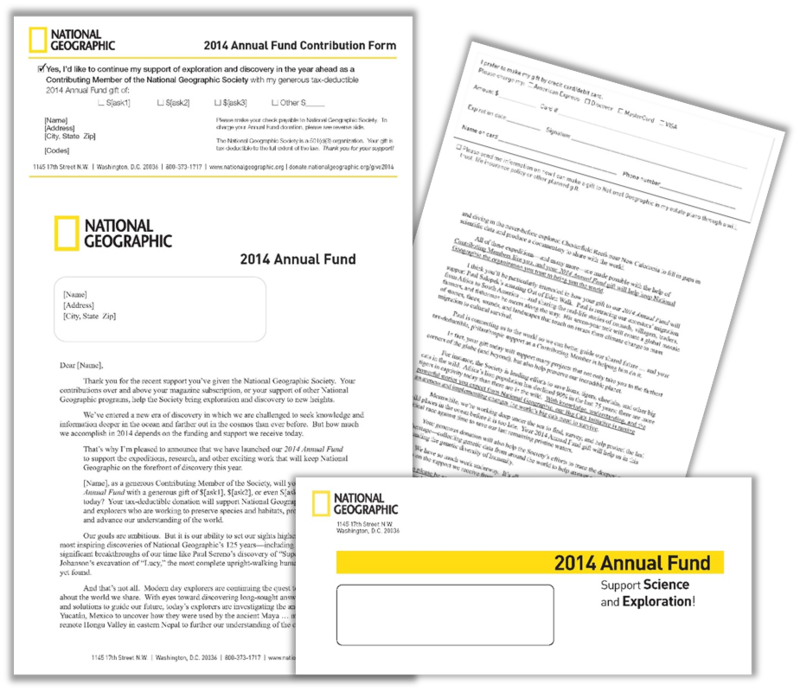 Corresponding art consisted of a window carrier with a “2014 Annual Fund” teaser in National Geographic’s signature yellow, a drop-cut letter/reply to minimize the high costs associated with such a small mailing quantity, and a BRE. We achieved our intended goal: a simple package with a clear and compelling case for support. RESULTS: The results of this Annual Fund appeal proved unequivocally that National Geographic’s new Contributing Members are committed to supporting the organization. The unbelievable 10.96% response rate blew away the budgeted 1.50%—and the average gift not only surpassed budget by 95%, but also exceeded the original acquisition effort’s average gift by 50%. The resulting revenue raised was 10 times more than budget. And despite such a small mailing universe (which traditionally renders direct mail campaigns cost-prohibitive), the cost-effective Annual Fund technique exceeded its net goal by almost $8000. Our institutional approach, coupled with telling members even more about a well-established nonprofit they are familiar with, proved to be a blockbuster approach to engaging new Contributing Members.